Hello, and how is your week going? Mine has been a very busy but very productive one, we have three shipments coming in this week so being sure to have plenty of coffee and of course a good nights rest. Does it sound nuts to say we are talking pumpkins, reindeer, and ornaments over here! After last season when where we were holding our breath for the holiday wrap and new ornaments to come in in November, I finally caught on and am doing things way in advance! Lots of amazing things coming this way so stay tuned. Enjoying the longer summer days and trying to slow down the pace just a little before the frenzy of the holidays gets the best of me. I have found myself enjoying more meals outside and just in general spending more time outdoors, taking full advantage of the long days of sunlight. I thought blue and white in the outdoors would make an excellent topic for today. Let’s face it blue and white is the most popular kid on the block right now, its H U G E! 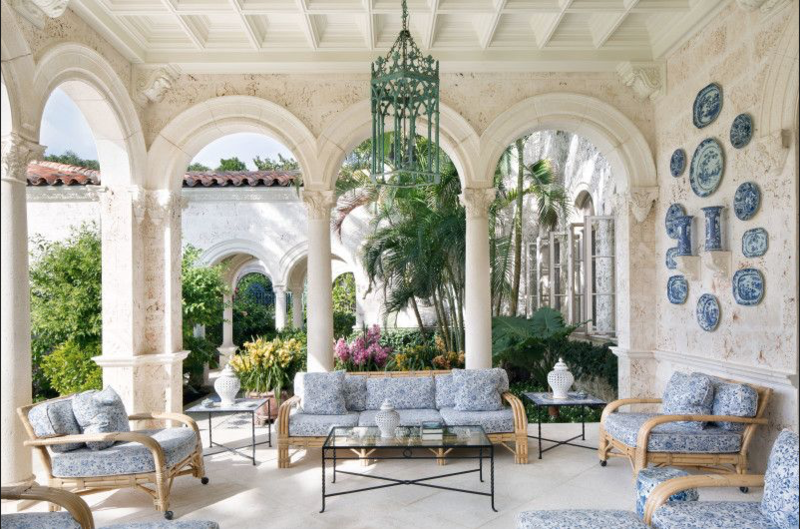 It has always been in style but is enjoying an exceptional resurgence right now. You sure don’t have to twist my arm! :) I adore blue and white outside because against natures vivid greens, it really pops. 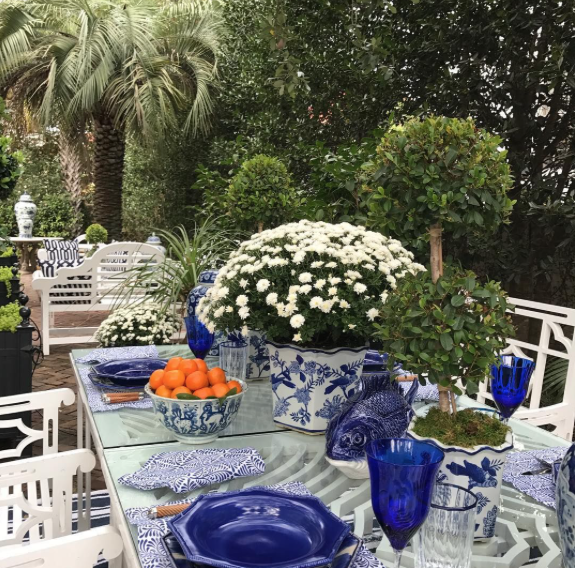 I have such a beautiful round up of gorgeous examples today to share about how beautiful blue and white outside really is with some of my own pictures thrown in. 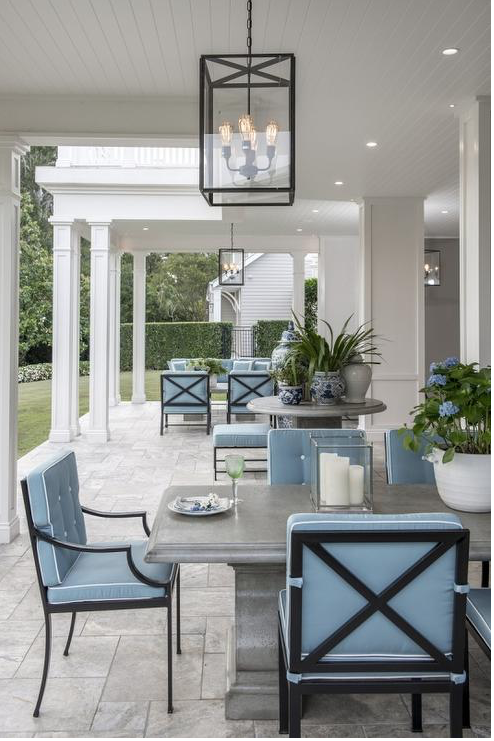 Then I want you to weigh in and tell me your thoughts on using blue and white outside. 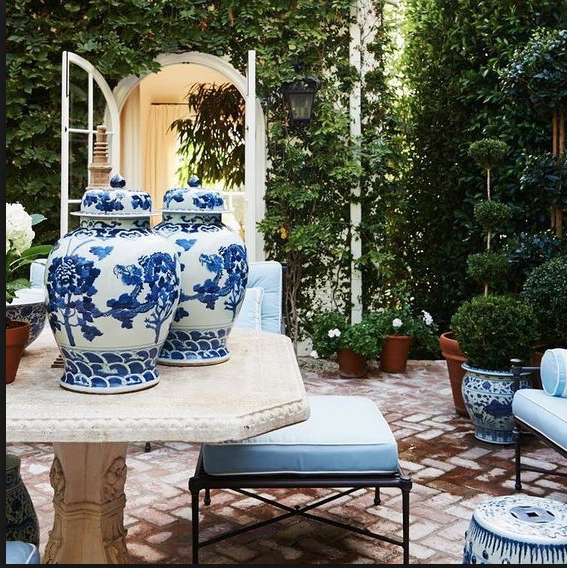 I have blue and white fishbowls and ginger jars on my own patio, but there is room for more! Believe it or not they stayed out all winter long and survived a brutally cold winter, a few heavy snow storms and they fared beautifully. 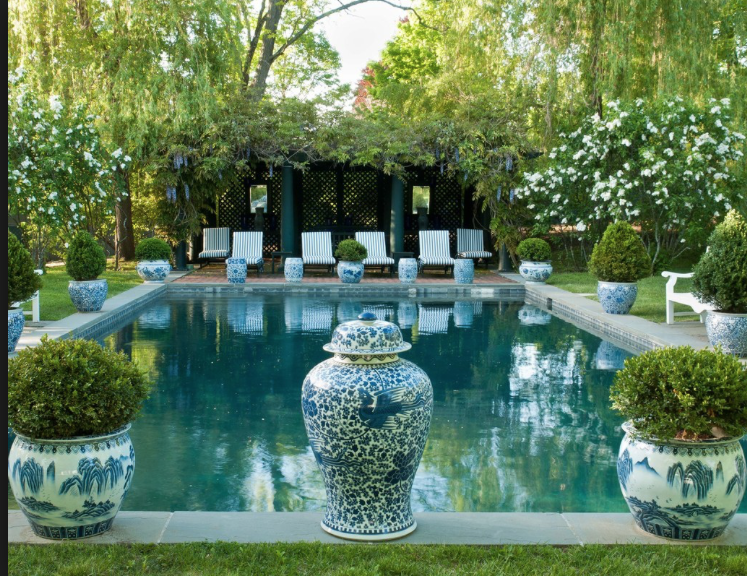 Another testament to the resilience of blue and white porcelain. 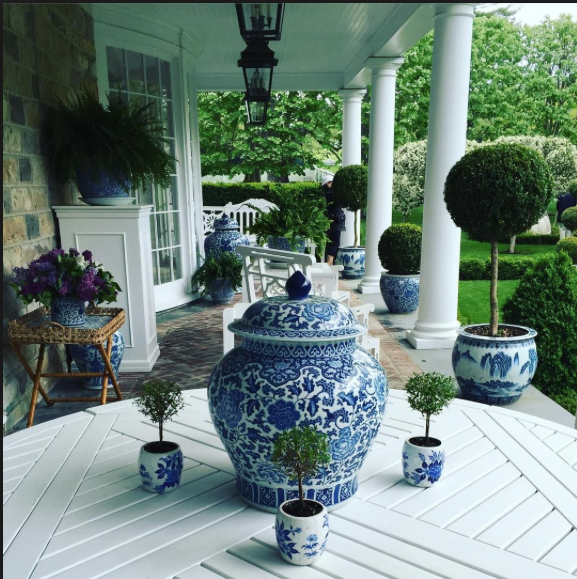 There is also a special code for anyone having the urge to add some blue and white to their outdoors spaces (details on bottom). So let’s take a look…. 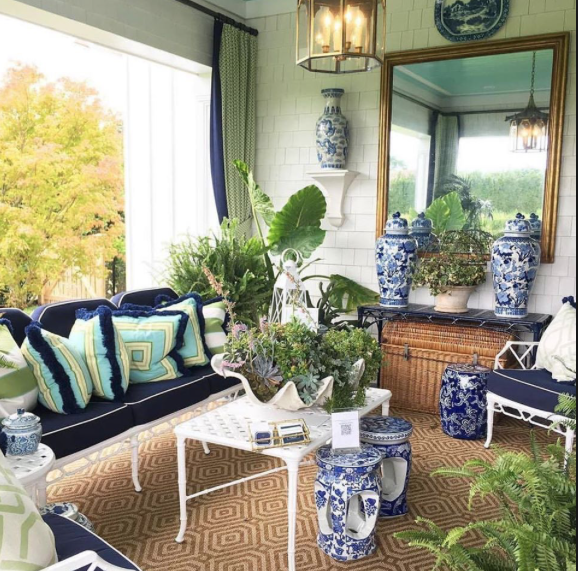 Just love this inviting vignette from KD Hamptons..what’s not to love! 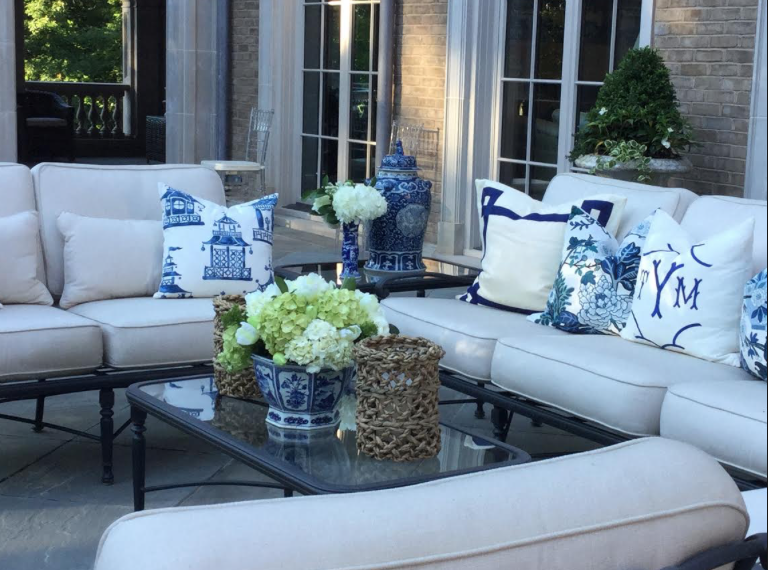 Part of the new Aerin collection, my favorite upholstery color with blue and white is white! Does this have you inspired to suddenly go outside and see how you can do a little tweaking? It sure has me thinking a mile a minute about changing a few things up. 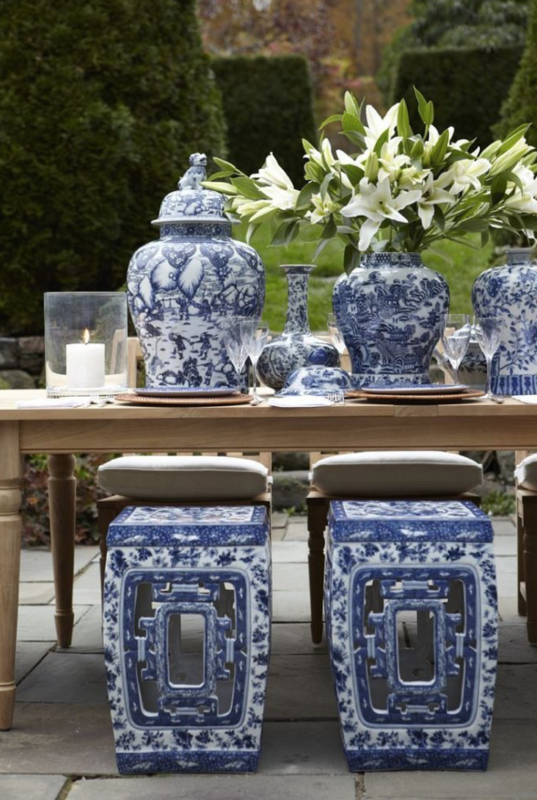 In fact, it makes me want to throw an impromptu blue and white dinner party:) OK, so maybe it will be just for two lol. Thanks for all the great inspiration, it’s making me want to rush out and buy more blue and white items. This is a beautiful post! 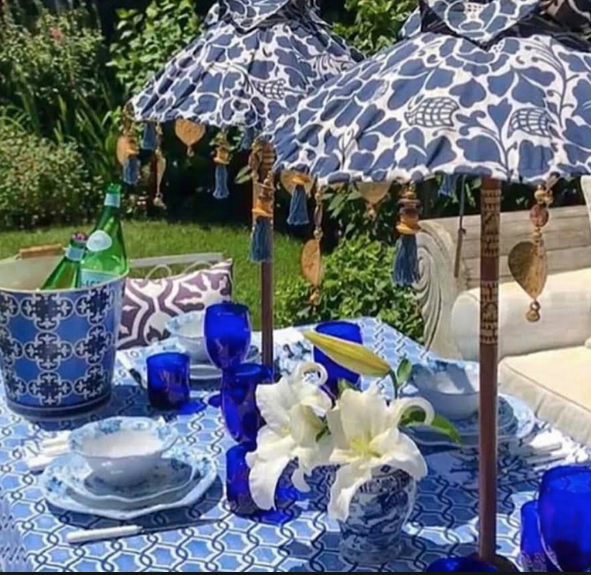 I got so many great ideas here, I bought two garden seats from you a month ago and they added so much to my patio, I think I now need some ginger jars! I love so many ideas here, thank you for this post and continuing to inspire me in so many ways. Hope you have a lovely day. 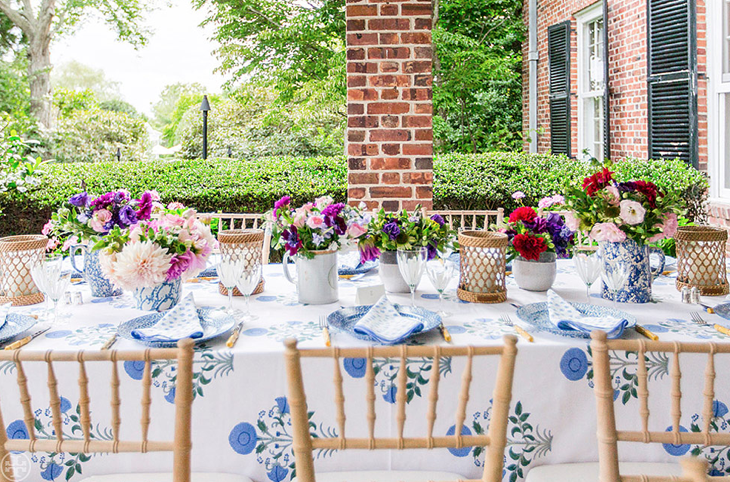 Loving almost anything Blue & White makes these real-life scenes a joy to see. THANK YOU! I am inspired for sure. I have a very small beginner’s collection that I plan to use at a 55th reunion (high school – I know, giving up my age) this Fall – our school colors: Blue & White! In the meantime I keep an eye out for more little vases to add. 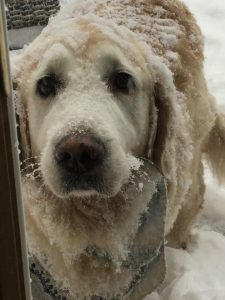 I really appreciate you sharing so much! The Carolyn Roehme pool shot is iconic. The perfect blend of everything. 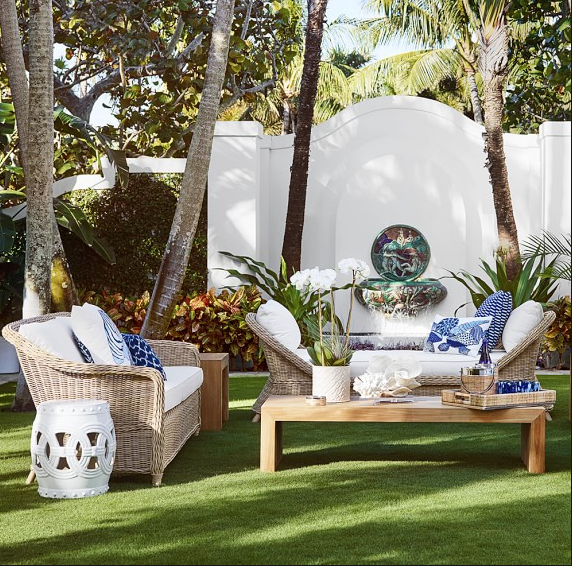 For outdoor living……I do like the involvement of green with blue and white. 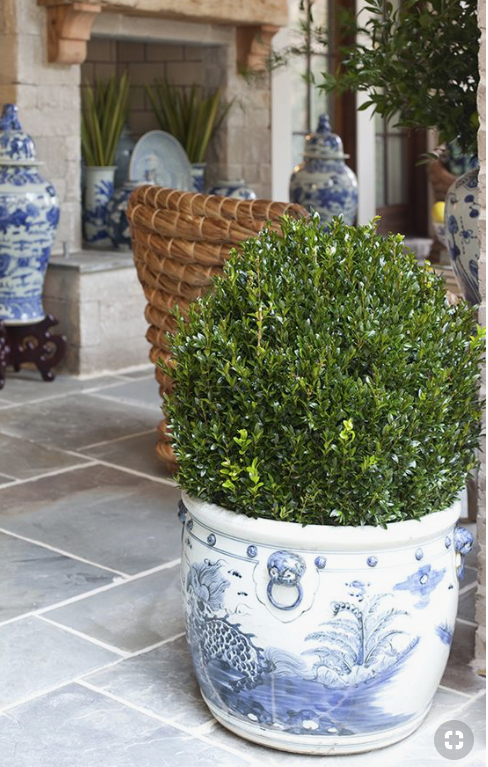 Love blue & white, & enjoy looking at the pictures to get ideas of decorating in this color. 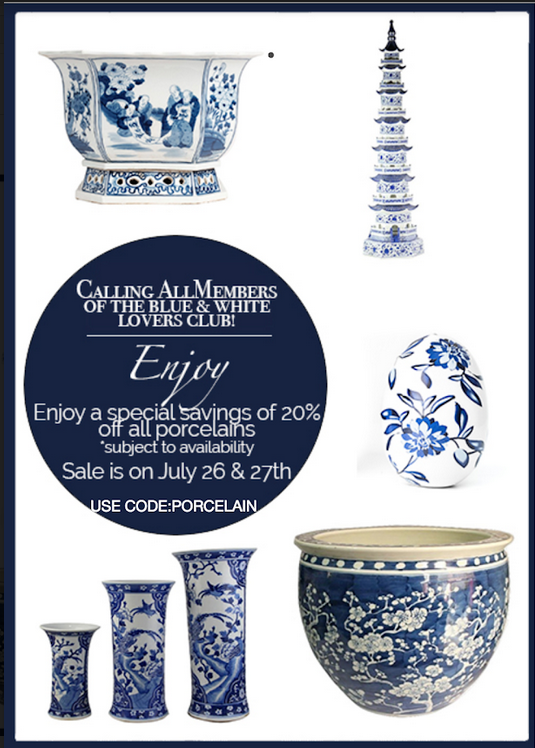 My master, powder & dining room are in blue & white. 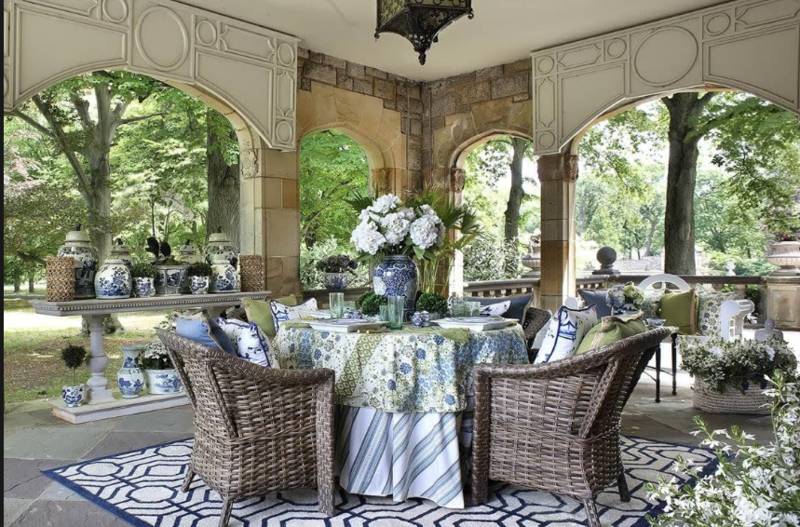 Several years ago, I tore out the same photo of Aerin Lauders patio that was in Arch Digest. 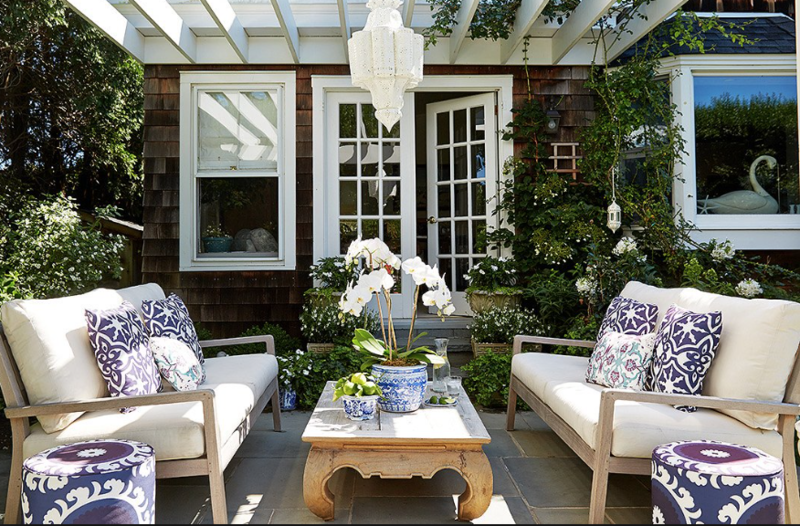 I have looked high and low to find large b/w garden stools like those in the photo. Do you know where I can find them? I live in Dallas, TX and have looked all over our Design District! Would LOVE to buy some! 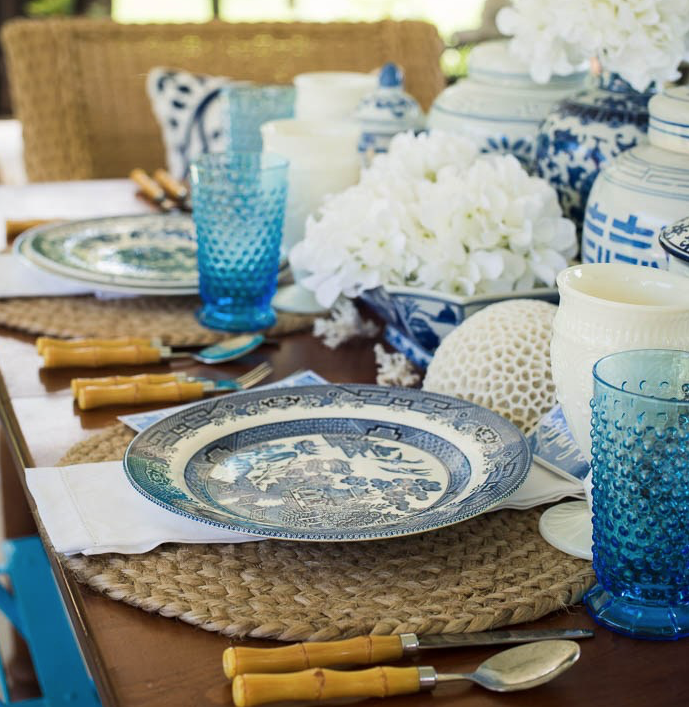 There is never such a thing as too much blue and white. Loved them all. All of the pictures were beautiful. 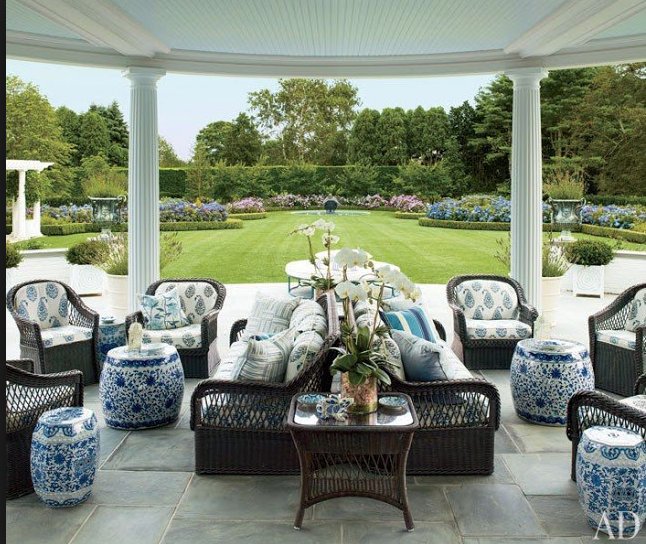 I think we have you to thank for bringing blue and white back to the forefront of design. 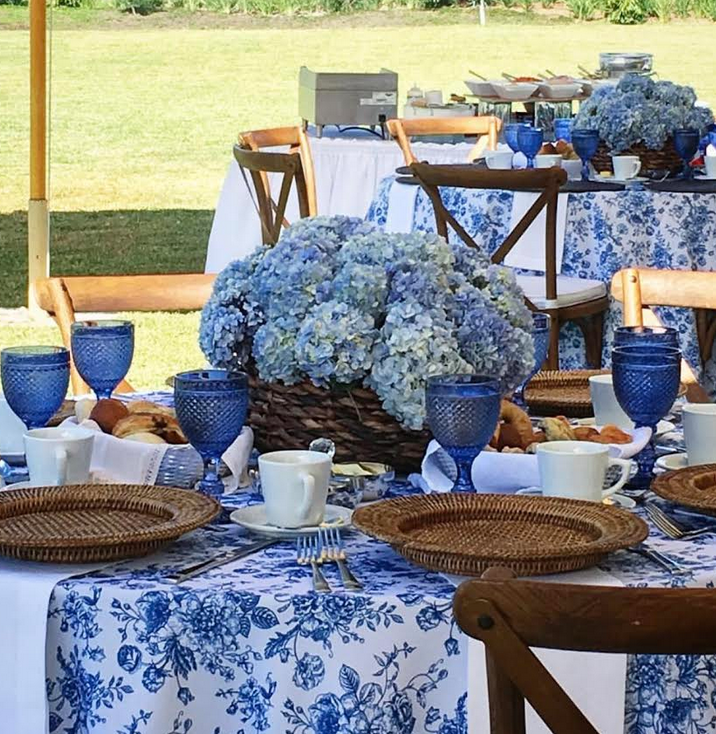 Blue and white have always been beautiful colors. 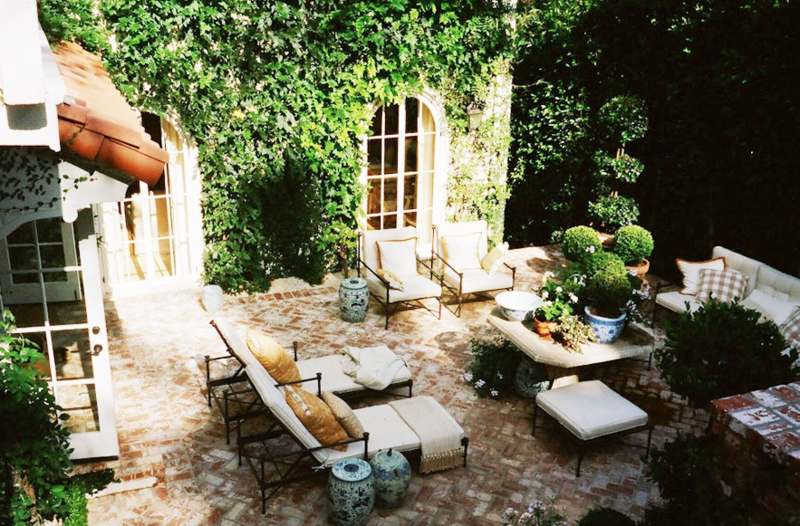 They exude a tranquil environment that is so beautiful and soothing to the eyes. Not only have I had those colors in my bedroom for years, every one of my prom dresses and then some were in different shades of blue with white accents. Is outstanding. Thank you for sharing. Blue and White Club so fun. 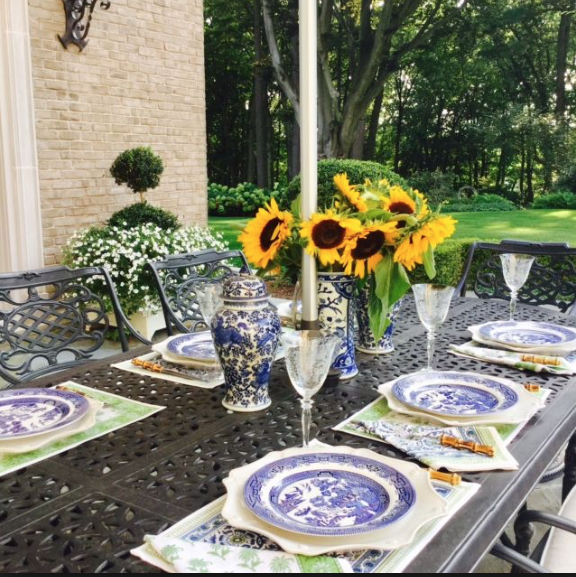 I love blue & white outdoors; especially accented with green! 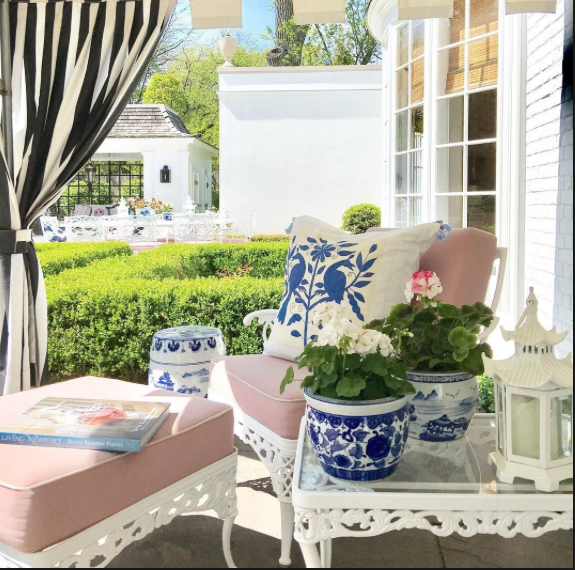 It’s your posts like these that always set my heart thumping and imagination running wild with more blue & white design options for my summer courtyard and front porch. Thank you, Tina! Oh what a beautiful post. I needed to see this inspiration we just moved into a new house a few months ago and my back patio looks so bare. I need to get busy, Tina when are you getting in the really big fishbowls again? I need four. I will also email you. 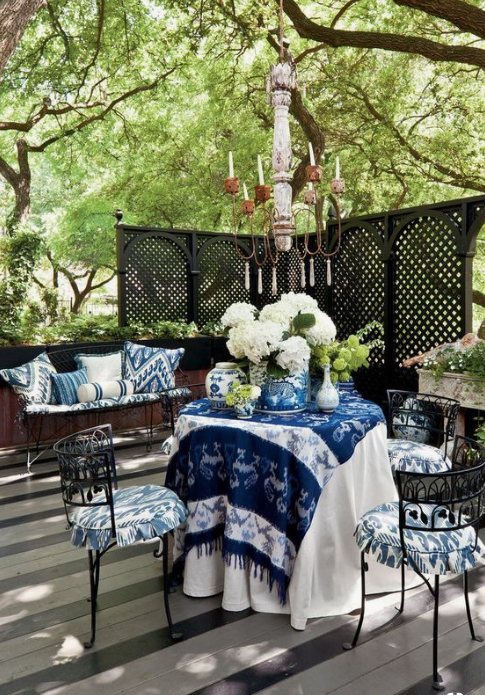 Love blue and white outdoors, it is perfect as you said against the greenery of mother nature! 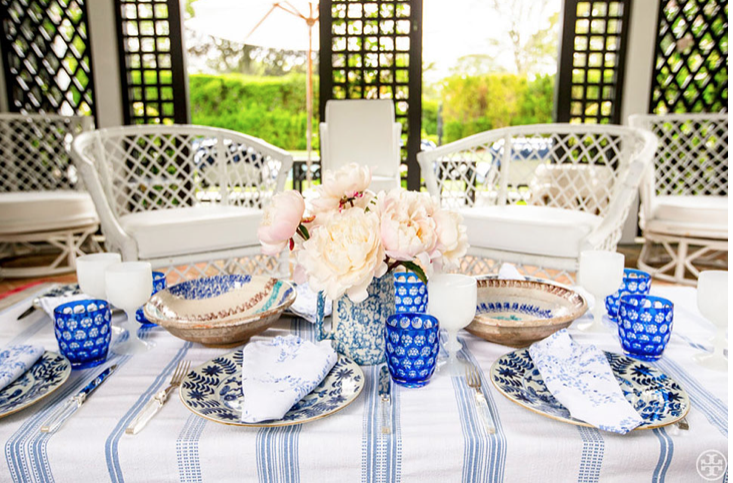 The garden is my favorite way to use blue and white! This post is very inspiring! Loved every blue and white photo; each photo was better that the last! 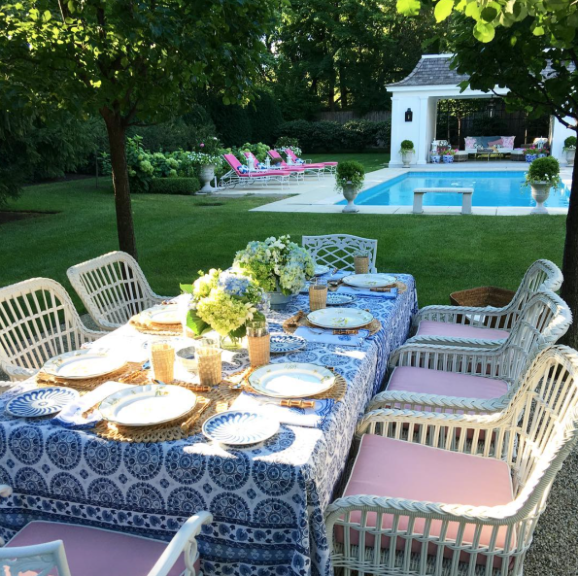 Such beautiful, “Eye Candy.” Now that August is just around the corner, we really have to savor our outdoor spaces but I do look forward to seeing what’s new from you for the holiday season. I can’t believe I just said that but they will be here soon, whether we are ready or not! 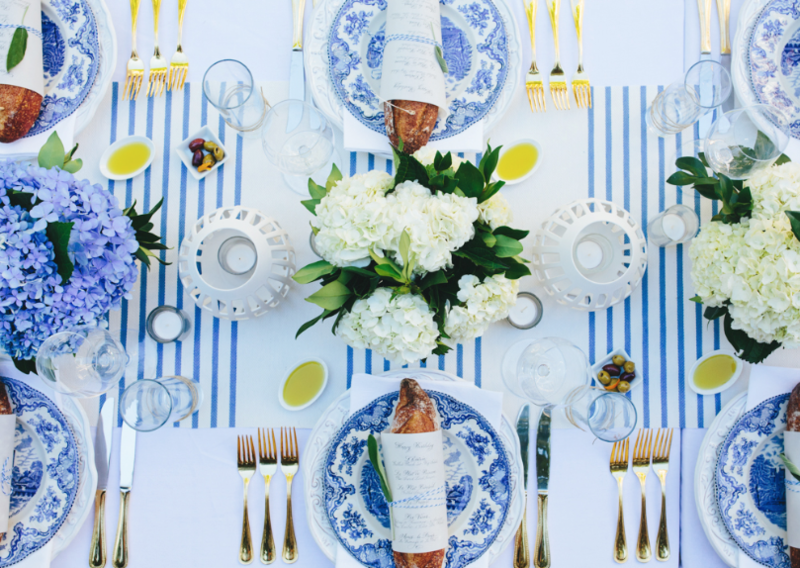 So inspired, just what I needed this week….my shot in the arm of blue & white! In the second pic (Carolina Roehm) there is a white bench. Do you happen to know where I can find one?